The screenshot above is hosted and provided by efsoftware.com. Please contact them directly for any copyright infringement as we are not responsible for that content. EF Multi File Renamer is a versatile tool for easily renaming multiple files or whole directories (including subfolders) in one step. EF Multi File Renamer's clear approach to renaming rules stands out when compared with similar programs. Your renaming tasks can be carried out precisely with very little effort. Select the rule(s) you need for the current task from an extensive set of pre-defined rules, each with its own settings. Complex tasks can combine several rules in the required order which can even be repeated. The integrated real-time preview immediately shows any changes you make to the parameters. Defined rules sets can be saved and used again. And because you can deactivate individual rules, EF Multi File Renamer offers a great variety of flexibility and function. The position of each rule in a set can be easily changed. 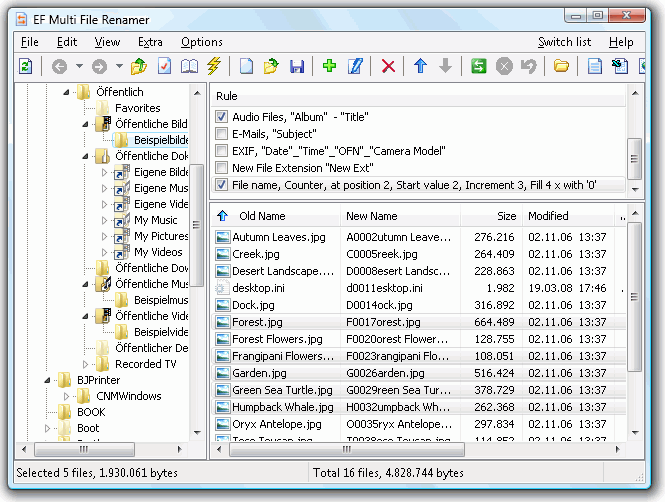 The Windows Explorer-like interface offers an optimal overview of the entries. Clear, easily understood definitions, from simple to complex renaming rules, with multiple options. Rule sets can be saved and used again later. Full real-time preview of the new file names before they are actually renamed, including error recognition when name conflicts occur. Undo the last renaming operation. Recursive processing of subfolders and the files contained in them. Filter function to restrict file renaming according to specific criteria. Integration of external third-party description plugins in WDX format. Export of file lists in different formats.